Signed and dated l.l. corner, white oil "DOBeLL/ 70". Prue Davidson, William Dobell - the painter's progress , 'The later years', pg. 110-133, Sydney, 1997, 110, 112, 133 (colour illus. ), 144. William Dobell: his life, art and home , 'New Guinea: a new beginning', pg. 65-73, New South Wales, 2011, 68, 72 (colour illus. ), 90, 99, 137. 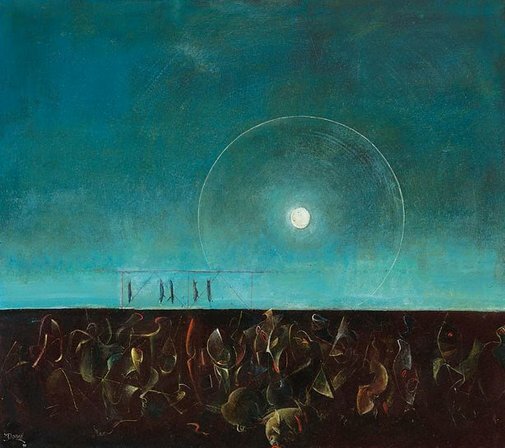 William Dobell: an artist's life , 'New Guinea and a new beginning', pg. 111-125, New South Wales, 2010, 124, 125 (colour illus. ), 164, 176, 203 (colour illus.). John McDonald, The Sydney Morning Herald , 'Paradise lost', pg. 16-17, Sydney, 04 Jul 2015-05 Jul 2015, 17. Review of the exhibition 'Painter in paradise: William Dobell in New Guinea'. William Dobell: hard drawing , Newcastle, 2007, 10, 11 (colour illus. ), 70.